Too Much Looking. Not Enough Leaping. 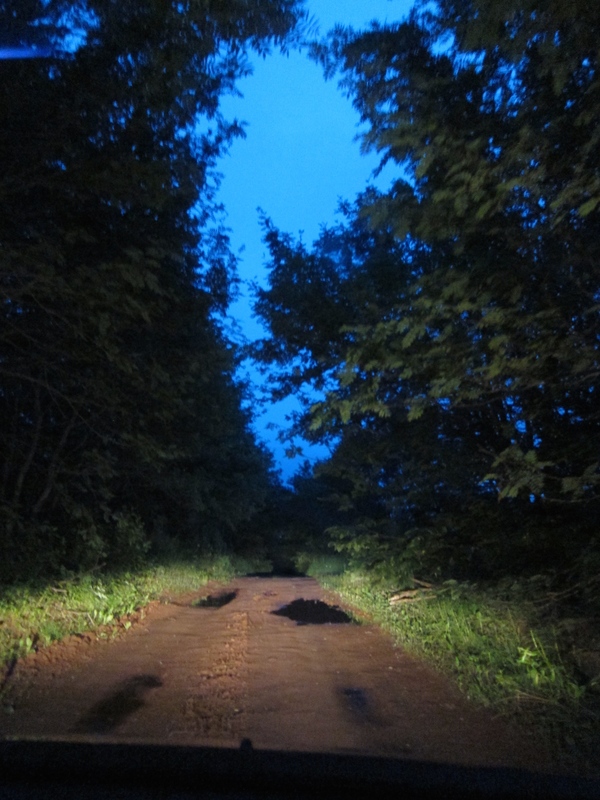 This is an actual road in New Glasgow, PEI. There’s a street sign and everything. AACK! I have to go for it, right? I have been tiptoeing around things and you know what? I am not much of a tiptoe-er in any other aspect of my life, so what the heck is my problem when it comes to asking for what I want? I don’t even care* right now. All I know is that it’s over. I’m only popping in here for a minute to tell you this. I felt you – of all people – should know. Life has a way of working out, when I do. I mean, we survived our adventure down the road** pictured above. That was a miracle of sorts. The Things were sufficiently freaked out and in all honesty I wasn’t sure we would make it out alive. Having an active imagination is a wonderful thing – until you turn down a one way, red dirt road, after dark, relying on a GPS (whose prowess thus far – let’s be honest – has proved to be sketchy at best) when you know darn well that you could have found your own way home. I asked Daddy-O to take a picture because no one would believe it otherwise and well, if we met our untimely doom, there would be, what? Evidence of our blind faith in technology? It was hard to capture what we were actually seeing. It was so dark. There were downed trees or large branches on the road along with deep grooves on either side of the car and a lot of deep puddles. It was as if the road was brand new. Like, we might be following the bulldozer – new. Frankly, it felt like a scene from a cheesy, scary movie. It was fun though! Lots of laughs and shivers and “Whoa!”s coming from inside our teeny car. Maybe we are a bit more invincible than we thought? I intend to find out. Oh! And there will be more PEI posts to come. I think everyone should come to the Maritimes and visit many places (all the times! ), but Prince Edward Island has a special place in my heart (that I can’t even really explain), so I will be sharing some serious PEI love this week and maybe, if I am fortunate, even more into this blog’s future. So, let’s see where this all leads, shall we? Tell me, are you a looker or a leaper? How is summer going, so far? Are you hot or cold? We are a lot chillier than we should be, I think, but hopefully it will be warmer soon. *That’s a lie. I always care. *Mt. Tom Road. FYI. Look it up. Fun! I dare ya! Hey! How can I help you? Hiya! It’s nice to see you! I’m sensitive and I’d like to stay that way. Never miss an opportunity to be kind! My Word for 2019. Or … ACTION – I Wanna Live! Happy New Year! Welcome To 2019. Let’s Make It Great! You know what they say? Likers gonna like! Horizontal stripes and a day to reflect. • That is all. • Happy! I channelled my inner Wonder Woman today and it *totally* worked! • I shared this photo and tagged a bunch of my favourite Wonder Women this morning in the Twitterverse and the Wonder Woman swag that my friends all have, use, and wear on the regular is truly spectacular. • So this (all of it!) is today’s happy. 💃🏻 • I hope you were able to find your happy today, too! About last night ... • ZOMG! • Happy! My Word for 2019. Or ... ACTION - I Wanna Live! Let's get our "buts" in check, so we can get our "butts" in gear!